The Ladies Champions Match 2017 is held in Erfurt, Germany from 31st of July till 4th of August 2017. The Ladies Champions Match is a 14-round match between Alexandra Kosteniuk and Elisabeth Pähtz. 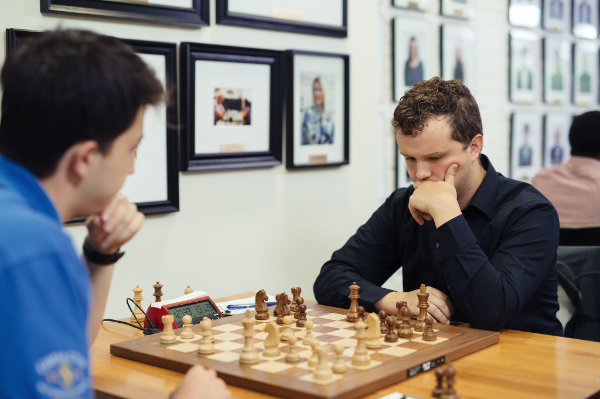 The match starts off with two classical games, followed by four Rapid games and finishes with eight Blitz games. Rapid: 20 minutes all moves + ; 10 seconds increment. Blitz: 3 minutes all moves + ; 2 seconds increment. The Young Masters (Women) 2017 is held in Erfurt, Germany from 31st of July till 4th of August 2017. The International Women's Open 2017 is held in Erfurt, Germany from 31st of July till 4th of August 2017. The World team completely dominated the Match of the Millennials with a 31.5-17.5 score. Not only did the U.S. team not win any matches, but they lost every single match in the U14 section. The American team was higher rated in the U17 section, but the World team proved to be better prepared and had a stronger team chemistry than their counterparts. This was a well deserved victory by the World team, who outplayed their higher rated and more experienced opposition. The day started with the World team leading by 11 points. The U.S. team still had a mathematical chance of winning the event if they won every single game. Granted that there were twelve games left, this was an impossible and unrealistic task. Both the morning and the evening matches ended in an even 2-2 score, which was more than enough to secure the win for the World team. On the American side, Sam Sevian and Ruifeng Li delivered convincing victories, whereas on the World side Haik Martirosyan and Andrey Esipenko continued their winning streak to keep the matches balanced. Once again, the U.S. team was no match for the World team. Awonder Liang was the only victor on the American team. He defeated the Uzbek phenom Nodirbek Abdusattorov and brought his score to a 2/4, which is still below his rating but it was a good recovery from a bad loss. 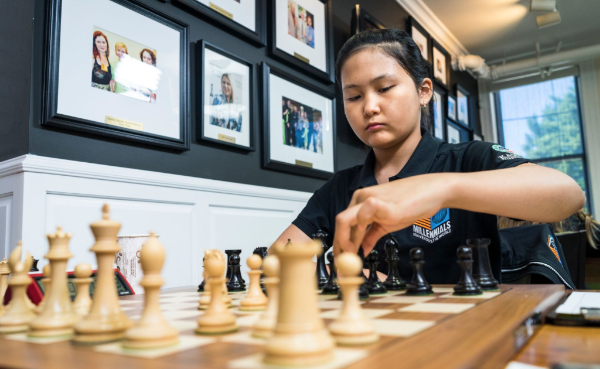 The rest of the World team won their games, including Nurgyul Salimova who won two games in a row after losing the first two games. The breakout star of the World team was Bibisara Assaubayeva, who was the only person on both teams to win all of her games. Overall, the World team players were very happy to have to the opportunity to play in the Chess Club and Scholastic Center of Saint Louis. They were impressed by the conditions, the hotel, the level of the organizations and the competitions. 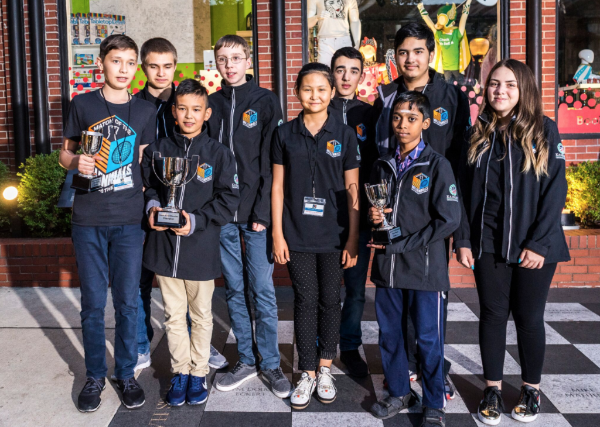 It was their first time visiting the U.S. and they were grateful to have the opportunity to compete at such a high level event with good prizes against a challenging competition. Even though many of them strive to become professional chess players, it was their first time being treated as true professionals. Even though it was a devastating defeat for the U.S. team, it was also a great learning experience for the American youngsters. The best lessons come from greatest defeats and this was no exception. 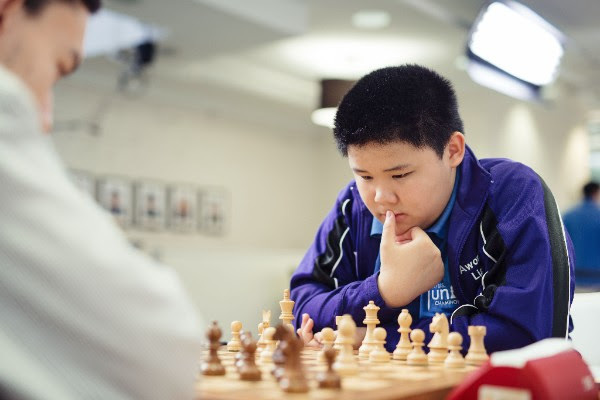 With the exception of Jeffery Xiong, none of them had any prior experience of playing in a team event and this was a great opportunity to gain insight into what it is like to play for the National Team at the Olympiad. 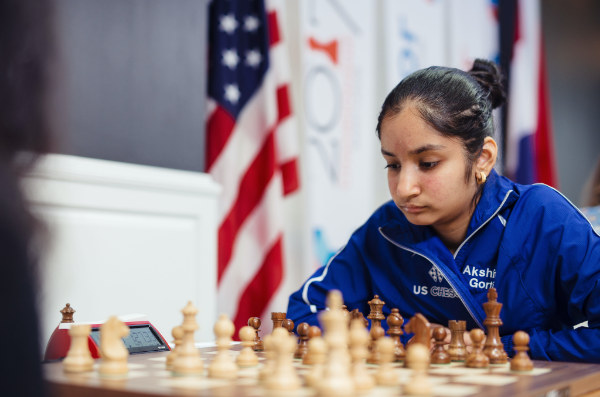 As the players keep improving, it is expected that at least several of them will make the U.S. Olympiad team and hopefully this tournament will be one they reflect back on as the first step on the ladder to the bigger stage of team events. Watch the games on ChessBomb. The 22nd Creon Open 2017 is held in Creon, France from 31st of July till 6th of August 2017. The U18 Spanish Championship 2017 is held in Salobreña (Granada), Spain from 31st of July till 5th of August, 2017. The Irish Championship 2017 is held in Ennis, Ireland from 29th of July till 6th of August 2017. The 104th British Championship 2017 is held Llandudno, Wales from 29th of July till 6th of August 2017. The Dresden Open 2017 is held in Dresden, Germany from 29th of July till 6th of August 2017. The 26th Kavala International Open 2017 is held in Kavala, Greece from 28th of July till 4th of August 2017. Follow the tournament live on ChessBomb.. The 13th Gazi-Heraklio Open 2017 is held in Gazi (Crete), Greece from 28th of July till 5th of August 2017. 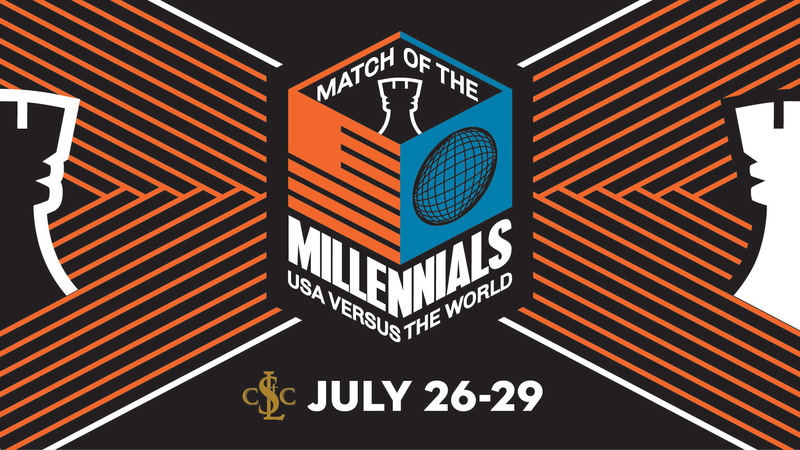 The Match of the Millennials will start on Wednesday, July 26 in Saint Louis. It's a competition between some of the strongest juniors in the USA vs the rest of the world. In the Under-17 category the players for each team are 5. U17 is a double Scheveningen with 4 games per round. Each round one player from each team is free. Tthere are 8 rounds in total. Scheveningen means that US players will only play Rest of the World-players. In the Under-14 category there the players for each team are 4: 2 boys and 2 girls. U14 is Boys vs Boys double Scheveningen and Girls vs Girls double Scheveningen. There are 4 rounds in total. Scheveningen means that US players will only play Rest of the World-players. 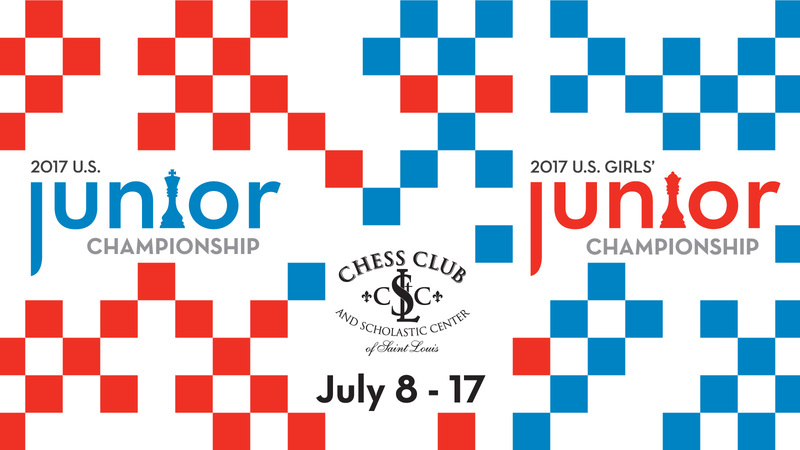 ST. LOUIS, July 24, 2017 - The Chess Club and Scholastic Center of Saint Louis (CCSCSL), in cooperation with the Kasparov Chess Foundation (KCF), U.S. 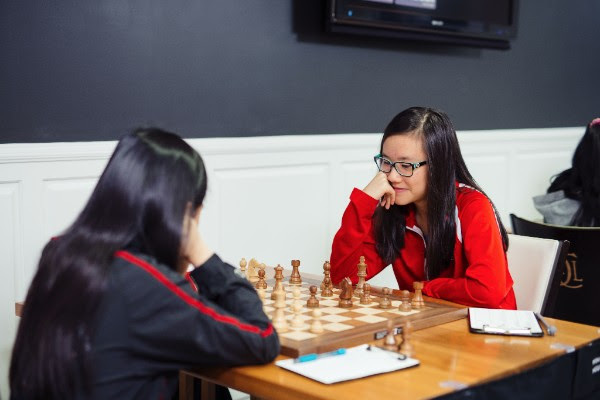 Chess Federation, World Chess Federation (FIDE) and FIDE Trainers’ Commission are proud to announce the U.S. and World Team players for the Match of the Millennials. Hosted at the CCSCSL from July 26th through the 29th, nine American players will face the nine best juniors from around the world. 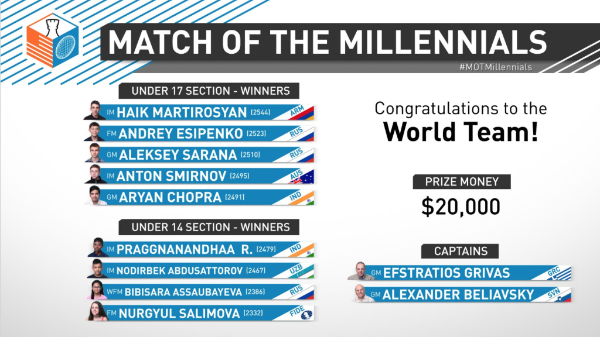 The Match of the Millennials tournament is not only unique in the young players representing all corners of the world, but also in its format. Across the four days of the tournament, players will compete in two rounds starting at 10 a.m. and 5 p.m. Each round will have eight games total, four from a U17 (under 17 years old) section and four in the U14 (under 14 years old) section. 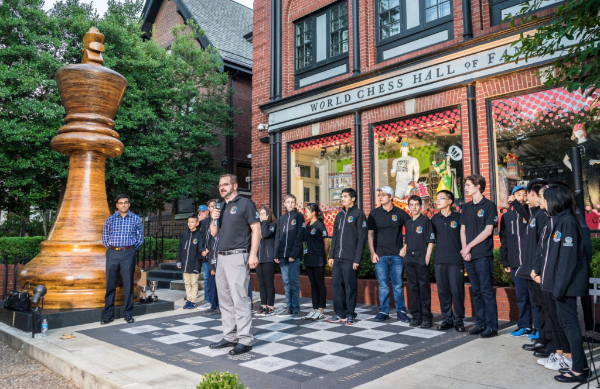 All games can be viewed live at uschesschamps.com with commentary by chess Grandmaster Alejandro Ramirez, Woman Grandmaster Jennifer Shahade, and the colorful commentary of Grandmaster Maurice Ashley on the smartboard. U17 Jeffery Xiong 2642 17 U.S.A. U.S.A.
U17 Sam Sevian 2633 16 U.S.A. U.S.A.
U17 Ruifeng Li 2568 15 U.S.A. U.S.A.
U17 John Michael Burke 2479 15 U.S.A. U.S.A.
U17 Nicolas Checa 2415 16 U.S.A. U.S.A.
U14 Awonder Liang 2536 14 U.S.A. U.S.A.
U14 Andrew Hong 2334 12 U.S.A. U.S.A.
U14 Carissa Yip 2261 13 U.S.A. U.S.A.
U14 Martha Samadashvili 2018 13 U.S.A. U.S.A.
Captains: Efstratios Grivas (Greece) and Alexander Beliavsky (Slovenia), Head of delegation/Coach Zurab Azmaiparashvili (Georgia). Villa de Gijon - III International Open RGCC 2017 is held in Villa de Gijon, Spain from 24 th till 30th of July 2017. The Sueca Open 2017 is held in Sueca, Spain from 22nd till 30th of July 2017. The Biel GM 2017 is held in Biel, Switzerland from 24th of July till 2nd of August 2017. 28th Czech GM Open 2017 is held in Pardubice, Czech Republic from 21st till 29th of July 2017. 2nd Csaba Arpad Memorial (Rapid) 2017 is held in Ajka, Hungary from 21st till 23rd July 2017. Sitges Open 2017 is held in Sitges, Spain from 22nd till 30th of July 2017. The 32nd Avoine Open 2017 is held in Avoine, France from 22nd till 30th of July 2017. The 35th Andorra Open 2017 is held in Escaldes, Andorra from 22nd till 30th of July 2017. The Match Yu Yangyi vs Alexander Grischuk is held in Jiayuguan, China from 20th till 24th of July 2017. * If the match is drawn the players compete in two games of 25+10 rapid chess, then if needed two 5+3 blitz games and, finally, one Armageddon game where White has 6 minutes to Black's 5, but a draw counts as a victory for Black. Follow the match live on ChessBomb. 10th Paleochora Open 2017 is held in Paleochora (Crete), Greece from 19th till 26th of July 2017. The event attracted 224 players from 27 different countries. 47 titled players are taking part including 15 grandmasters and 15 International Masters. Kirill Stupak, Momchil Nikolov and Vitaliy Bernadskiy won the event with 7.5/9. Congratulations! The last game of the whole tournament was played by Annie Wang and Rachel Ulrich. Both of them played a fantastic fighting tournament, and their personal encounter wasn’t any different! Annie Wang played the famous Breyer variation, and even though she was initially slightly worse, after hours of play she took control of the game. Rachel Ulrich didn’t give up however, and fought hard until they reached a Queen endgame. After the long struggle Annie ran into a perpetual check, but one slip was enough and it seemed that Ulrich missed the draw. At that moment, Ulrich found the fantastic resource 80.g3+ Kf3 and she came with the move of the tournament, Qf2! !, Kxf2 Stalemate! A wonderful display of the fighting spirit of the tournament! That left the leader Kayden Troff, and his rival Awonder Liang to duke it out for the U.S. Junior Championship title. Troff did not change his tactics, and played his usual lines, but his opponent Mika Brattain was very well prepared against Troff. Troff wasn’t prepared for this variation and was clearly in trouble and it was clear that Brattain won the opening phase. Meanwhile, Liang also had to get acquainted with a type of position he had not seen before. Michael Brown played the Berlin Defence, and an early d6. Liang did not seem to be familiar, so it was clear that there would be a long struggle! Hours later Mika Brattain played the courageous 16.d5!, which seemed to me to be the strongest and most natural. He followed it up with energetic play, centralizing his pieces with 18. Rad1! and 19 e5!, Troff was forced into defensive. At this moment Liang’s position wasn’t clear, but Brown seemed to be at loss and it was increasingly difficult to find plans for both sides! Getting closer to time trouble, Mika Brattain launched his final attack; it was just too strong, and even though Troff tried to defend it, the defensive front eventually collapsed and Mika Brattain won against Troff! This was the golden moment for Liang, as a draw would force a tiebreaker match with Troff, but a win would mean the Championship Title! Liang doubled up on the ”e” line and after Brown’s inaccurate move 34…e4, Liang opened up the position with the powerful 34.f3! At that moment it was clear, with precise play, Awonder Liang was going to win. Precise he was, and after some nervy play from both sides, Liang broke through with the knight maneuver Ne2-d4-f5! putting decisive pressure on Brown’s position. Brown resisted heroically, but Liang was unstoppable and with confident play, he converted his advantage! Liang, with this clutch win, won the 2017. U.S. Junior Championship! Troff came second and Rufieng Li and Akshat Chandra tied for third. Akshat Chandra became third on account of his better tiebreaker. A great U.S. Junior Championship ended with a dramatic final. 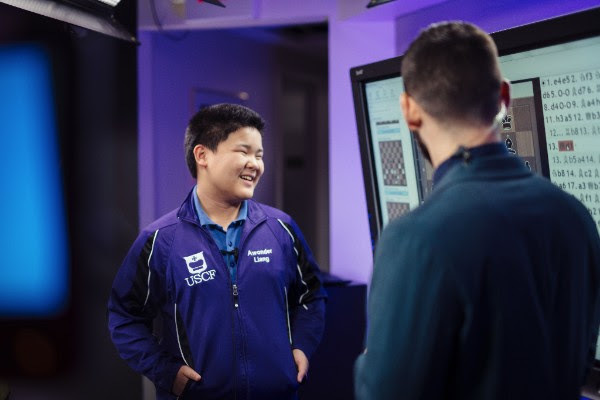 Troff and Akshat Chandra played good chess, but Liang proved to be the strongest, as he managed to win the most critical games at the crucial moments! The Champions of the 2017 U.S. Junior Championships are Akshita Gorti and Awonder Liang.